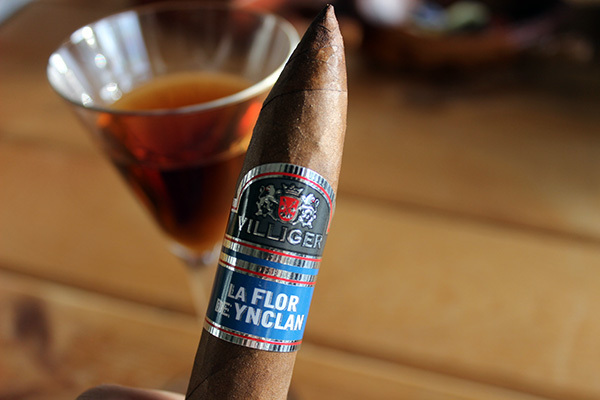 Villiger La Flor De Ynclan Cigar Review – A story of friendship. 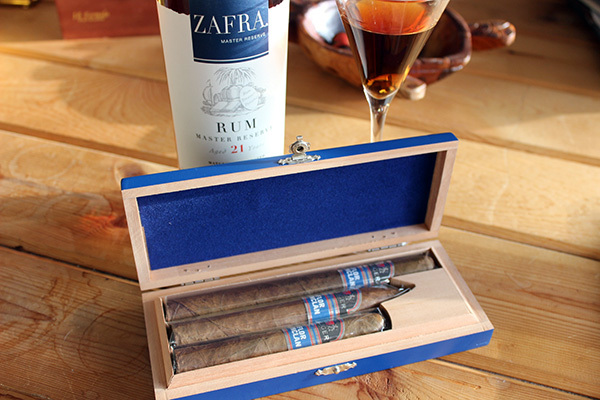 I have always said, cigars are more than just tobacco leaf rolled and smoked. Cigars are a lifestyle, a way for people from all walks of life to bond over a common enjoyment. We like to say it’s a Fellowship of the Leaf. 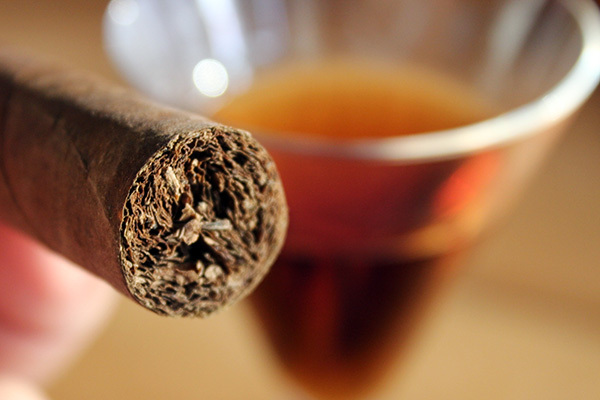 Cigars allow us to sit back and take the time to enjoy a relaxing moment with old friends and new ones. This bond of the leaf has gone on for generations – centuries in fact. It matters little if you are a banker, lawyer, truck driver, or hair dresser; the time spent enjoying a cigar brings us together. In fact, one such bond occurred 22 years ago when famed cigar maker and Villiger Soehne AG Chairman of the Board, Heinrich Villiger, met Jose Matias Maragoto, a young ambitious Cuban native who was living and making cigars in the Dominican Republic. …Jose Matias Maragoto was an unknown cigar maker, who was beginning a new life in a new country. Fast forward two decades, the once untested Matias Maragoto is the overseer of all Villiger made product made in the DR. 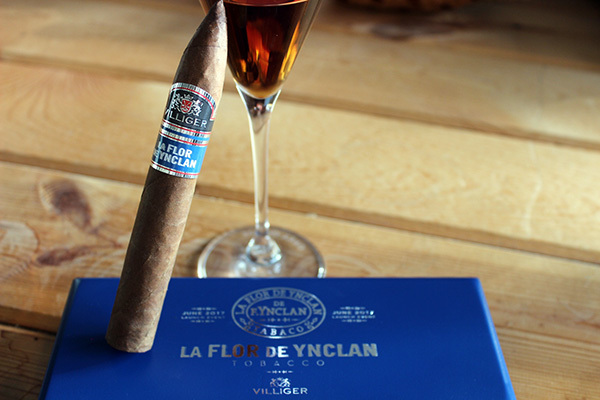 The Flor de Ynclan cigar, is the fruition of a bond between two different men from different backgrounds, over the love of tobacco. In celebration of this bond, Villiger will be rolling out the La Flor De Ynclan cigar at this years IPCPR. 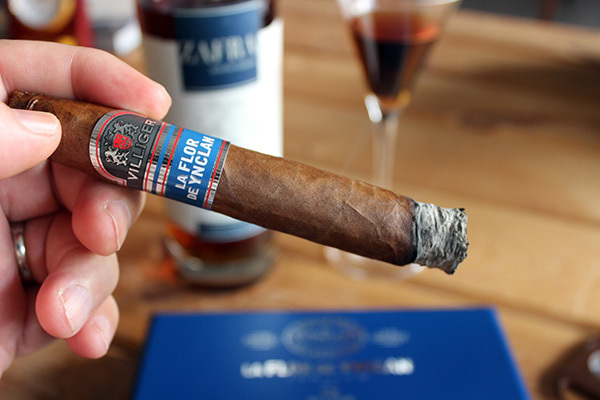 Pronounced “een klahn“, Villiger Cigars actually produced a small batch of the La Flor De Ynclan over a decade ago but was unsatisfied with the result and decided to cease production. The creation of every cigar carries a story, and this is no different. 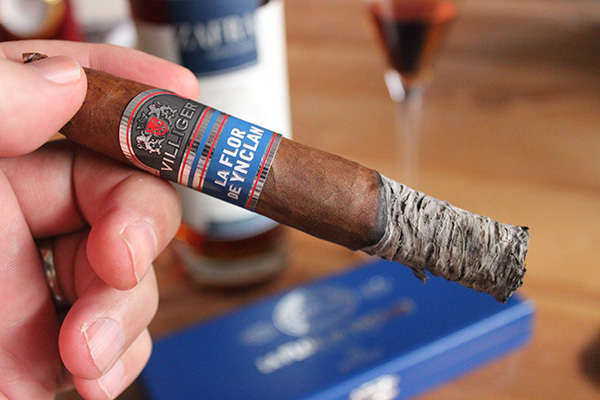 The La Flor De Ynclan is a special cigar, diligently crafted by Heinrich Villiger and master blender Jose Matias Maragoto of ABAM Cigar Factory in the Dominican Republic. 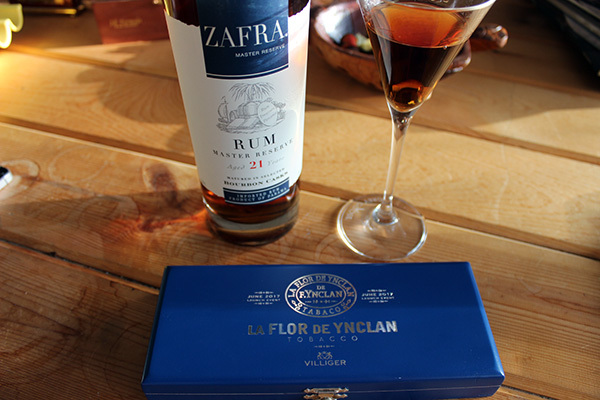 As part of the La Flor De Ynclan roll out, they had a pre-launch party that included sampler packs of the La Flor De Ynclan. The Sampler included 3 different vitolas, a Robusto, Torpedo, and Churchill. I was gifted one of these samplers and today I would like to provide a review of this fine cigar from Villiger Cigars. As mentioned above the original La Flor De Ynclan was deemed not ready for production and pulled from the market over a decade ago. The tobacco was set aside and aged, while Matias meticulously tweaked the amount of the Indonesian, Dominican, and Nicaraguan tobacco within its Ecuadorian wrapper. Now as the 2017 IPCPR approaches, the La Flor De Ynclan is what both Heinrich and Matias imagined it could be. The Villiger La Flor De Ynclan will be available in three vitolas and packaged in 25-count boxes. First off, the Villiger La Flor De Ynclan is a stunningly beautiful cigar to look at. In fact the sampler box itself was eye-catching with its deep blue color and silver print. That motif is carried over to the band also with an added and red and white to accent the colors. These cigar will most certainly pop out on a humidor shelf. The Ecuadorian wrapper has a medium milk chocolate-brown color to it along with a bit of tooth and was light on veins. 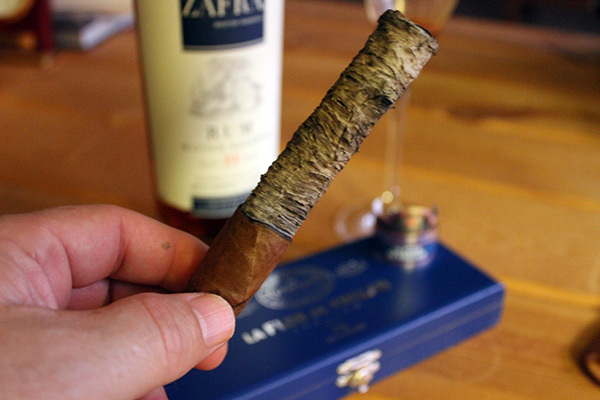 The cigar is firm to the touch with no soft spots or spring to the barrel and has a nice weight in the hand. All three vitolas have perfectly finished caps just waiting to be snipped. 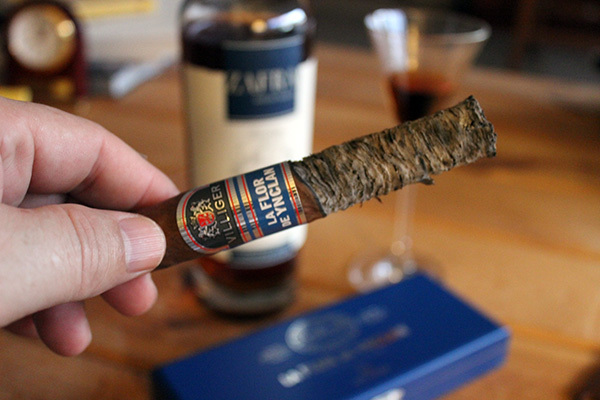 For this review I sampled the Torpedo which had a sweet fermented aroma along the barrel and notes of cinnamon, nut, and sweetness on the foot. I sliced the cap on a 45 degree angle giving me about a 1/4 inch opening. The cold draw was just to my liking and offered notes of earthy truffle, nut, and very slight hint of pepper. It passed the Stogie Press “palm test” with flying colors assuring me the barely visible seams were tight and closed. 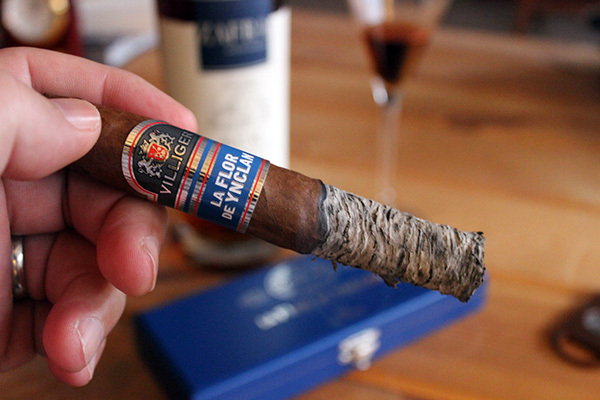 Passing all the preliminaries, it was time to ignite the La Flor De Ynclan and see how it performs. Straight burn – I love how the burn keeps up, not letting the line wave. So well constructed! Total Smoking Time was 75 minutes down to the nub! 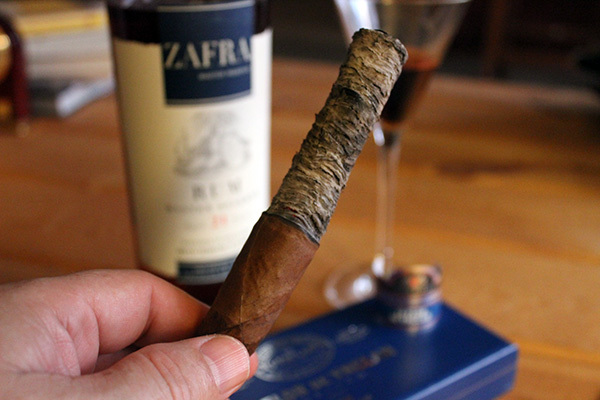 Overall, the Villiger La Flor De Ynclan was an amazing cigar with consistent full flavor, perfect construction, and an incredible ash.This paired extremely well with the Zfran Rum that was recommended by the company, bringing out the fruit nuance that ran though the core of the cigar along with the sweet cinnamon spice. I have been a fan of Villiger Cigars ever since I smoked the Villiger Cabareté Maduro back in 2014 which made the Stogie Press top 25 for that year placing #8. This year the La Flor De Ynclan is even better than the Cabareté Maduro and will hit my list of go to cigars in shop if they carry it. Top 25 for 2017? We shall see! Villiger North America was established to service the premium cigar enthusiast primarily in the United States. With production from some of the most respected manufacturers in Dominican Republic, Central America and elsewhere, it is the goal of the company, to introduce the finest smoking experience a premium handmade cigar has to offer. Today, and in the future, one can rest assured that when they choose a Villiger cigar, the quality of the leaf, the manufacturing, and even the packaging will be second to none. This entry was posted in Cigar Review, Villiger and tagged cigar review, Heinrich Villiger, IPCPR 2017, La Flor De Ynclan, Matias Maragoto, Villiger Cigars. Bookmark the permalink.